Almost 50 years ago, the founding owner of the Finca El Dehesón D. Mariano Barceló decided to dedicate the entire farm to the development of the brave Spanish Red Partridge, with large investments and putting in it all his personal effort. The result of this enormous effort is that at present, there are thousands of partridges on the estate. For this type of hunting, each client must have two shotguns, so that while he shoots with one, the secretary will charge the other. In each day five eyes are made in different areas of the estate. Due to the extension of the farm, we can offer up to three consecutive days of hunting, without repeating any browsing. 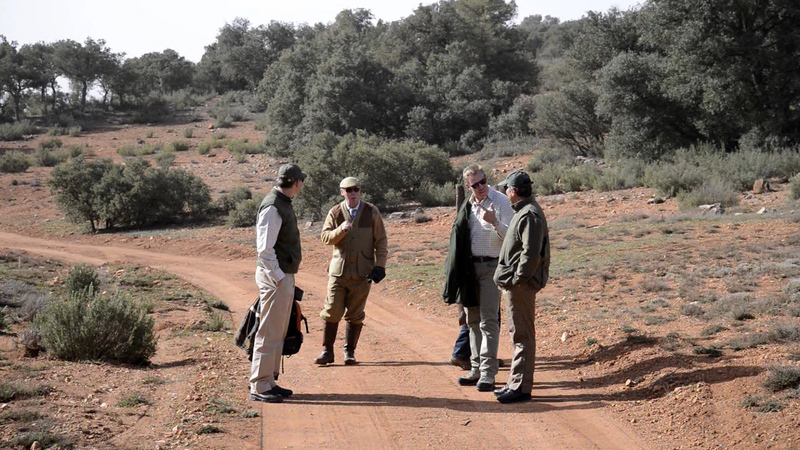 The whole operation is personally directed by the owner, in order to guarantee the success of each hunting day. The hunt is done in the Spanish modality of “Ojeo” and it is really spectacular to see how hundreds of partridges fly over each hunter at high speed, while the client shoots trying to shoot as many as possible. If you are interested in practicing this type of hunting, do not hesitate to contact us.